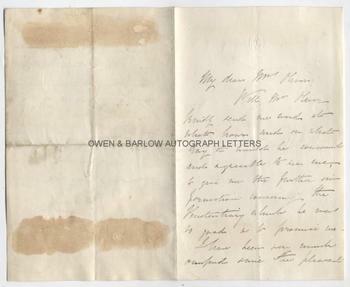 ALFRED WILLIAM HOWITT Autograph Letter Signed. Australian (British born) explorer, naturalist and Australian anthropologist. ALS. 2pp. West Hill Lodge. Tuesday night [no month or year]. To Mrs Oliver. 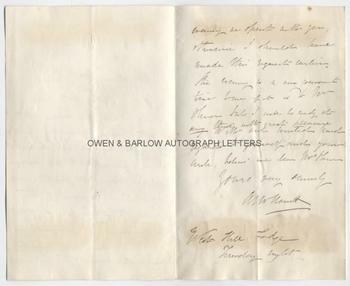 "Will Mr Oliver kindly send me word at what hour and on what day it would be convenient and agreeable to see me, to give me the further information concerning the Penitentiary which he was so good as to promise me. I have been very much occupied since the pleasant evening we spent with you, otherwise I should have made this request earlier. 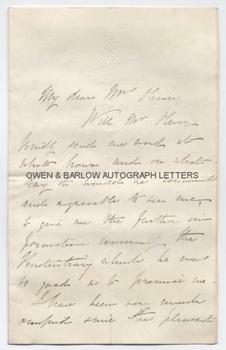 The evening is a very convenient time to me if it is to Mr Oliver but I will be ready at any time with great pleasure. With our united kind regards to yourself and your circle, believe me, dear Mrs Oliver, Yours" [etc]. 8vo. Approx 7 x 4.5 inches. Mounting traces to blank verso, else near fine. Alfred William Howitt was the son of the author, William Howitt, and the poet and writer, Mary Howitt nee Botham. In 1852 he emigrated to the Australian gold fields. Aged 22 he worked as a geologist in Victoria and was later appointed police magistrate and Commissioner for the Crown Lands and then Secretary of the Mines Department. In 1861 he was appointed by the Royal Society of Victoria to head the expedition in search of Burke and Wills. Alfred William Howitt was a skilled bushman and succeeded in locating the ill-fated Burke and Wills and recovering their bodies. Howitt mounted several expeditions of exploration in various parts of Australia and collected many botanical specimens new to science. Alfred William Howitt was one of the first to research the culture and society of the aboriginal Australians and his work on this is now recognised as one of the foundations of the modern science of anthropology.